Eighty-three chapters are included in this volume. Anatomy and Physiology are discussed in detail, along with evaluation of the voice and larynx. The specific voice disorders covered include dysphonia, acute and chronic laryngitis, dysphagia, and many more. Separate sections discuss general principles of treatment, benign lesions and masses of the larynx, pre-malignant and early laryngeal cancers, vocal fold paralysis/paresis, airway obstruction and stenosis, office laryngeal surgery, and voice practice and new innovations. 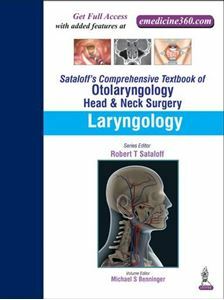 This volume is a thorough guide geared toward practicing otolaryngologists and otolaryngology residents. Chapters 18, 36, 41, 54, 57 and 73 contain video(s).